Days after a busy shooting session in South Africa, popular Nigerian celebrities who are now honourable Glo ambassadors have returned to the country. 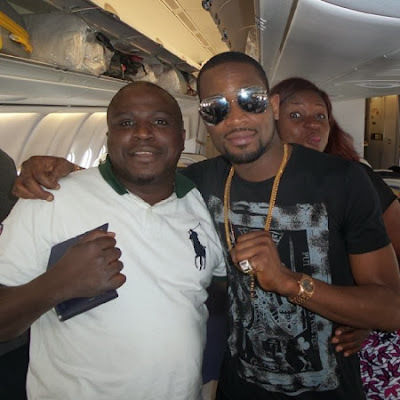 The Globacom ambassadors led by Nollywood movie director Desmond Elliot, Kannywood actor Ali Nuhu, comedian Gbenga Adeyinka, comic actor Okey Bakassi and singer Waje were spotted with D’banj on Thursday as they arrive Nigeria from South Africa. 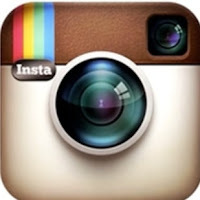 Insiders revealed that the entertainers travelled to South Africa for a Glo advertisement shoot needed for globacom’s upcoming promotional campaign. Kokomaster D’banj who recently proclaimed his love for Nollywood actress Genevieve Nnaji was also present at the Glo advert shoot as the main voice behind the music. 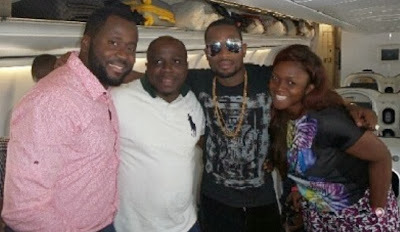 Photos of the celebrities having a nice time with D’banj aboard a Nigeria-bound plane surfaced few hours ago. nice,but dbanj pls leave genny @ of this, she is nt ur business patner,n i dont think she can expect ur love bc u hav join them. U̶̲̥̅̊ are all welcome bacK home. 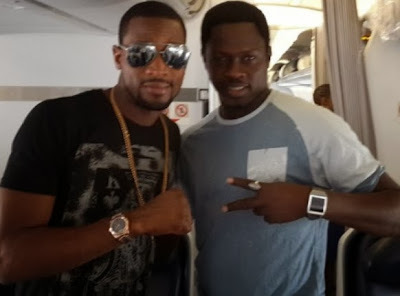 Big boy ali nuhu. « Tiwa Savage Pregnant Before Wedding?